Hip hip hooray! The Muni wires will stay! In a swift defeat of what could very well be the dumbest idea to hit San Francisco ever (and there sure is stiff competition in that realm), the Super Bowl planning committee has withdrawn their own plan to remove Muni’s overhead trolley wires around Justin Herman Plaza. A representative of the Super Bowl 50 Host Committee apparently said in a phone call to Supervisor Jane Kim’s office that after some analysis the committee decided it would not move through with plans to remove Muni wires. There was no mention during the phone call of the public backlash to the plan, according to Kim’s office. Great news, although, as Market Street Railway points out, the F-Market route will essentially be cut in half, with bus substitutes running west up Market Street and streetcars remaining along the Embarcadero. Several bus routes will be rerouted as well. You can read the whole story over at the Examiner’s site. Done and done. No need for the petition. 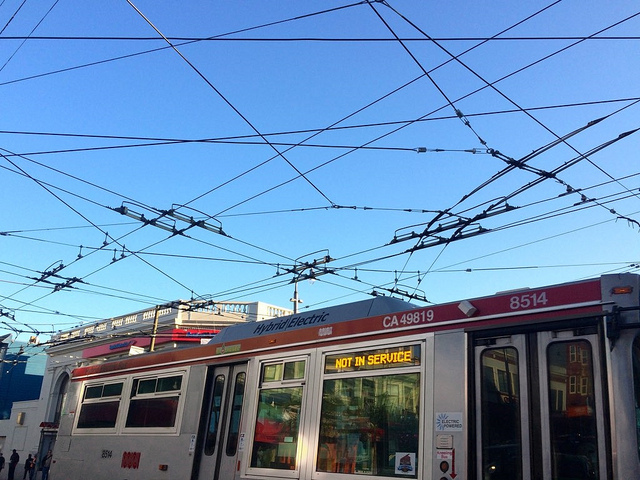 But please don’t stop sharing your rad photos of Muni wires! What’s San Francisco without the Muni overhead wires? That was never ever going to happen. Take your Super Bowl story walking. This is what makes San Francisco great and unique from other cities. Hell yes! Keep those wires up always! There will still be Muni and bus disruption or rerouting but the removal of the wires would have added weeks to the process. I checked the petition’s page at Change.org and they claimed victory after 932 signatures and a posted announcement from the Super Bowl Host Committee that they were changing their plans, allowing the wires to stay up. According to an article in the SF Examiner, the Super Bowl Host Committee may not refund Muni for the additional cost of detours during the Super Bowl parade. How’s that for sore losers?